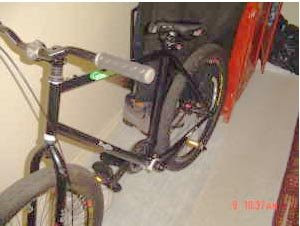 Cyclesnack: Nice Niner on Craigslist! Since today's ride, a morning eye opener at Huntington State Park, got washed out I thought I would check out who's selling their 29ers in the area. The only one I found was a nice Niner down in Westchester. Question is, is this a shop selling the bike or someone who bought it, took a ride, and figured it wasn't for them. It's too bad but hey when go from squish to rigid, you really need to realize that you are making a commitment to ride differently. In fact, I think it's a great way to improve your riding skills because you now have to be picky on your lines, which really teaches to pay more attention to the trail. On a full squish rig, and even some hard tails, most riders see to get into a fire-and-forget mode but when you are riding rigid, every bump counts. Having a 29er does help somewhat in that area but you still can't just ride the trail indiscriminately. 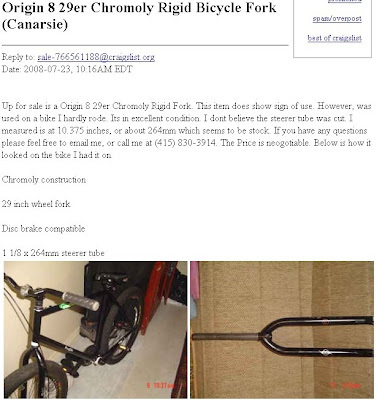 I emailed the owner to find out why he is selling such a sweet bike. If I get a response I will post it as a comment. 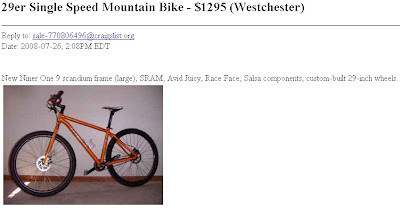 What's interesting to note in this next ad is that it would appear that the 29er is a fixie! Now, that's cool. An obvious clue on the picture below is the single handbrake. Can't find any reference to this bike on the FGG, though. Not much really to go on though, but that label on the top tube looks a lot like the Willits logo, so much that I think this bike is a Willits Scorcher.